It looks like Gears of War isn't going to the PlayStation any time soon. Microsoft said this morning it had bought the series from Epic Games, assuring that the only console Gears will call home will continue to be Xbox. Development of the series will continue at Black Tusk Studios of Vancouver, B.C. Additionally, Rod Ferguson, the former director of production of the series at Epic, will join Microsoft "and play a key studio leadership role at Black Tusk," Microsoft said. This morning's news did not mention when a new game in the series could be expected. "Black Tusk has assembled a world-class team with deep experience and passion for the shooter space, and specifically the Gears of War franchise," Phil Spencer, Microsoft's head of game studios, said in a statement. "I am extremely confident that under the leadership of Hanno Lemke (of Black Tusk), Rod Fergusson and our other leaders in the studio, Black Tusk is well equipped to take on the future development of the Gears of War franchise. Black Tusk teased an unnamed video game at E3 2013; the studio is owned by Microsoft. This makes two projects it is now working on. Fergusson left Epic Games in 2012 to join Irrational Games and assist the completion of BioShock Infinite but with that game finished, moved on to another project within 2K Games. "Epic Games has reached an agreement to sell the 'Gears of War' intellectual property rights to Microsoft. 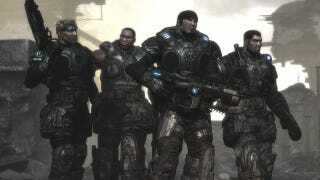 We're very proud of the franchise we built in close partnership with Microsoft over the past decade and are happy that this agreement enables Microsoft to forge ahead with the 'Gears' universe on their industry-leading platforms as Epic concentrates its efforts on new projects," said Epic founder and CEO Tim Sweeney. "Epic remains totally dedicated to supporting Xbox One and is licensing the Unreal Engine 4 technology to Microsoft in support of their future projects."